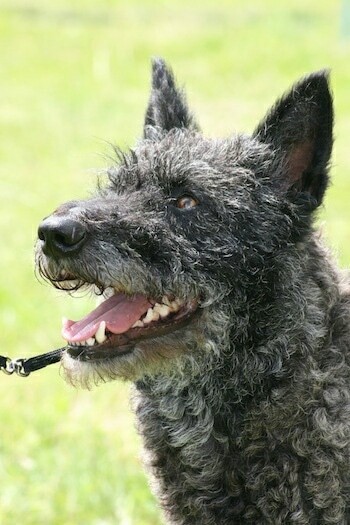 The Dutch Shepherd comes in three varieties: longhaired (long, straight, flat and harsh), shorthaired (quite hard, not too short) and wire-haired (medium length—dense harsh and tousled—more curly-coated than wire-coated). Heavy white markings on chest and feet are not desirable in the show ring. Although the coat types vary, the color possibilities remain the same for each: various brindles in all shades of gold and silver and brindle with dark stripes. 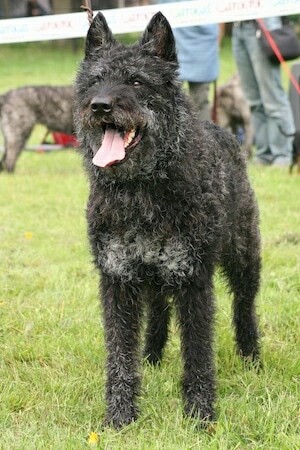 Blue brindle is also listed under the rough coated variety. The short hair is most common in Holland, while the long hair is less common and the wire haired variety currently has a dangerously low population. The body is firm, without being coarse. The muzzle is slightly longer than the flat forehead. The teeth are strong and have a scissor bite. The eyes are dark, almond shaped and slightly slanting and the medium-sized ears are carried high and erect. The tail is slightly curved. The chest is deep and the belly slightly tucked up. The feet are oval with well-knit arched toes, black nails and dark pads. There is some confusion as to whether or not the Dutch Shepherd has dewclaws. A lot of sources say it does not, but they do indeed have dewclaws in the front. They do not have dewclaws on their hindquarters, however. When discussing the hind legs, The Dutch breed standard says "Hubertusklauwen: niet aanwezig" which translates to: “Dewclaws: none present.” That same word “hubertusklauw” does not, however refer to the front dewclaws. The most common notation for that would be "duim" or possibly "bijklauw." There is no separate word for the front dewclaws in the English language, and that is what can lead to the confusion, but the breed does sport dewclaws in the front. The Dutch Shepherds are among the most competent of all shepherd dogs at such tasks as agility, catch, obedience competitions, guard work, herding, field trailing and companionship. Attached to its territory, and an enthusiastic worker, this affectionate, happy-to-be-around dog is obedient, sober and very loyal to its handler and family. Friendly, loving, playful and highly energetic, this very happy dog is cunningly smart. Provided children are seen as pack leaders, they can also be good friends with them. Unwanted visitors will be stopped in their tracks, while known family friends will be greeted enthusiastically. Dutch Shepherds enjoy the company of their own kind and get along fine with other animals. Intelligent, easy to obedience train and eager to learn—they learn new commands quite easily. This breed makes an excellent watch and guard dog. Active, lively and alert. 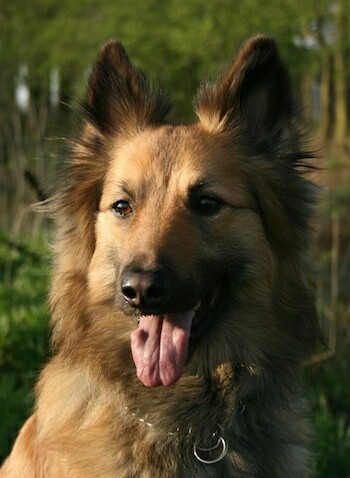 The shorthaired variety is the most common sort for defense/police dog trials. It needs little care and can withstand fatigue and bad weather. The objective in training this dog is to achieve a pack leader status. It is a natural instinct for a dog to have an order in its pack. When we humans live with dogs, we become their pack. The entire pack cooperates under a single leader. Lines are clearly defined and rules are set. Because a dog communicates his displeasure with growling and eventually biting, all other humans MUST be higher up in the order than the dog. The humans must be the ones making the decisions, not the dogs. That is the only way your relationship with your dog can be a complete success. 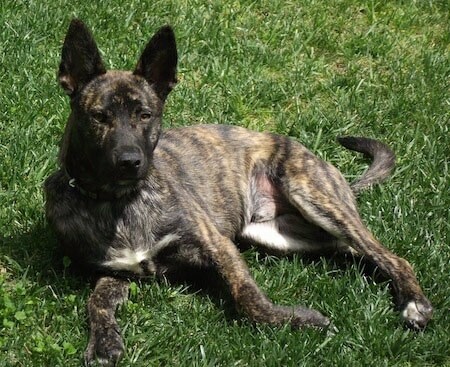 The Dutch Shepherd will do okay in an apartment if it is sufficiently exercised. Its all-weather coat enables it to do well in cold climates. Dutch Shepherds need to be kept both physically and mentally exercised. They need to be walked or jogged daily, where the dog is made to heel beside or behind the human holding the lead, as instinct tells a dog the leader leads the way, and that leader needs to be the human. Because they want to work, run them through a regular drill at least twice per week. They make great jogging companions. Let your dog run beside a bicycle, or take it into the woods or open countryside where it can run to its heart’s content. Both long and shorthaired varieties require regular grooming with a comb and brush to remove the dead and loose hairs. The wire-haired coat should be plucked professionally twice a year. The hair can be clipped in a few places as a finishing touch. The excess hair on the ears should be removed. The wire-haired variety should never be brushed, although combing is fine in moderation. A coarse comb should always be used. Bathe the all-weather coat only when necessary, as it will remove the natural oils in the skin. 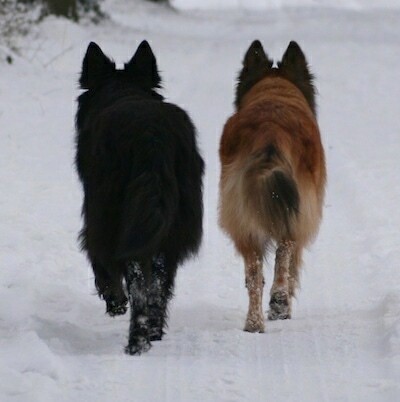 The Dutch Shepherds and the Belgian Shepherds share a very similar standard. Differences are slight in size and proportion requirements, as well as, obviously, coat color. Like the Belgians, their origins lie in the same gene pool of continental herding dogs that also created the German Shepherd around the same time as the Belgian and Dutch Shepherd were created. 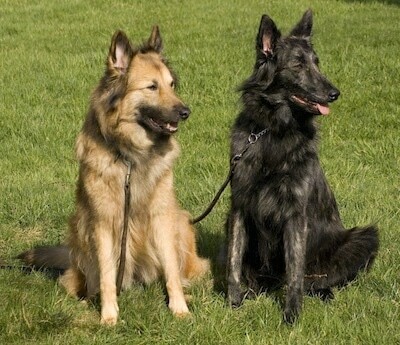 The Dutch Shepherds and the Belgian Shepherds are judged by the same standard requirements except for color. 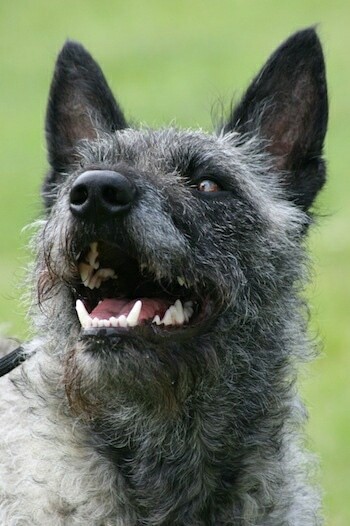 While the related Belgian Shepherds have become well known in the United States and Europe, the Dutch Shepherd has not attracted a large following yet. 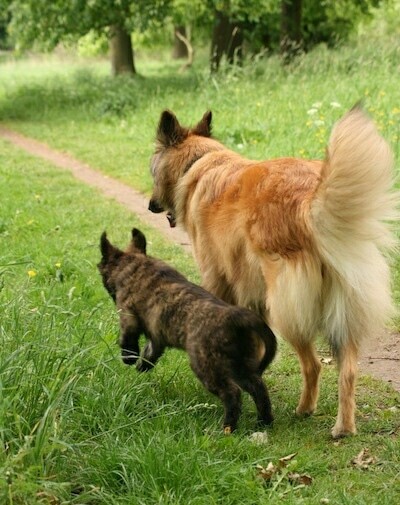 Even in the Netherlands, the numbers of Dutch Shepherds are limited and dangerously low for the wire-haired variety. Almost unknown outside Holland, the Dutch Shepherd is valued there for its ability as a herder and for its quick reflexes. 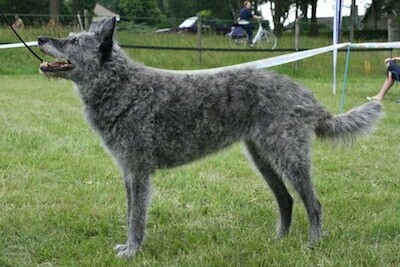 Originally an all-purpose farm guard, herder, cart-puller, guard, police and security dog, this breed, in its various coat textures, evolved in the early 1800s in the southern part of the Netherlands, especially the province of Brabant, and in neighboring Belgium, which was then part of the Netherlands. Division by coat texture occurred when dog shows began 100 years ago. 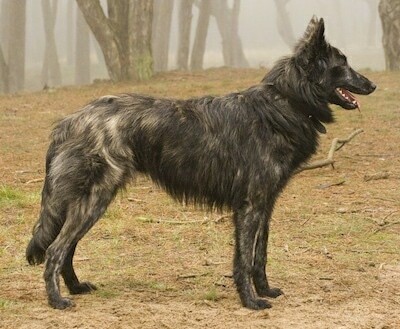 Rarely, non-brindle fawn dogs can be found in all coat varieties, and while they are Dutch Shepherds, they have an undesirable coat color and are marked as such on their pedigrees. Any departure from the ideal standard should be considered a fault, but the seriousness with which a fault should be regarded should be in proportion with its degree and its effect on the functional health and welfare of the dog. 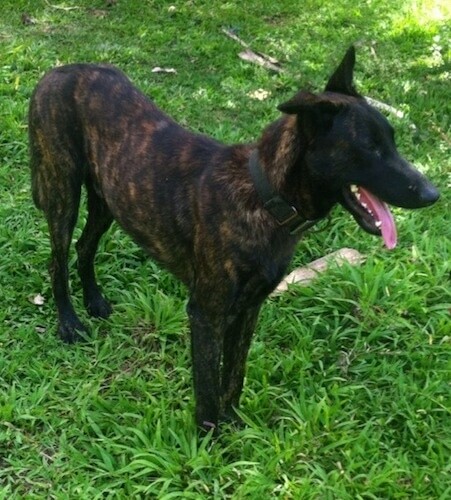 Tin-Tin the Dutch Shepherd at 3 years old—"Tin-Tin is very loyal and a great protector!!!"